Mikuni at Fairmont Singapore, will be flying in a very special guest all the way from Hong Kong - Chef Lawrence Mok from I M Teppanyaki & Wine. On 26 & 27 May 2016, you will get to witness a rare exchange and collaboration of true culinary craft between Executive Chef Moon Kyung Soo of Mikuni and the Master of Teppan. Get a glimpse Chef Mok’s contemporary approach in the unique art of teppanyaki and of his food philosophy. Have all your five senses engaged as you watch Chef Mok performs behind the grill, heave the smokey and buttery aroma, hear the sizzling, taste the masterpieces and last but not least, be charmed by Chef Mok's sense of humour. During this special guest chef appearance at Mikuni, Chef Mok and Chef Moon will prepare a 5-course lunch menu and a 9-course dinner menu. The menu focuses on balance and complement. 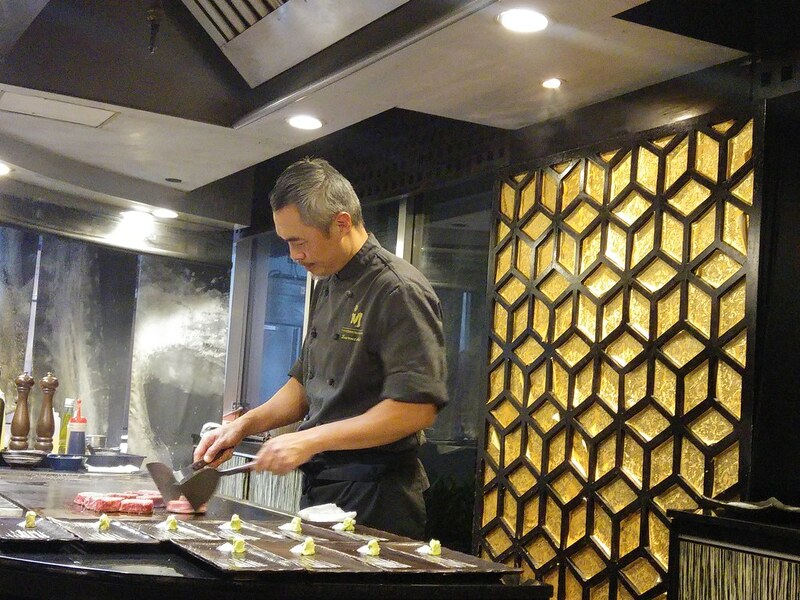 As teppanyaki tends to be heavier in taste and body, the dish alternates between Chef Mok's and that of Chef Moon, which is towards light and tang. The evening started with a welcome drink by Bannie Kang, a talented mixologist at Anti:dote, alongside a Mikuni Small Bite - Uni and Prawn, encapsulated within the membrane. The flavours that burst out upon a bite, was pretty stimulating. 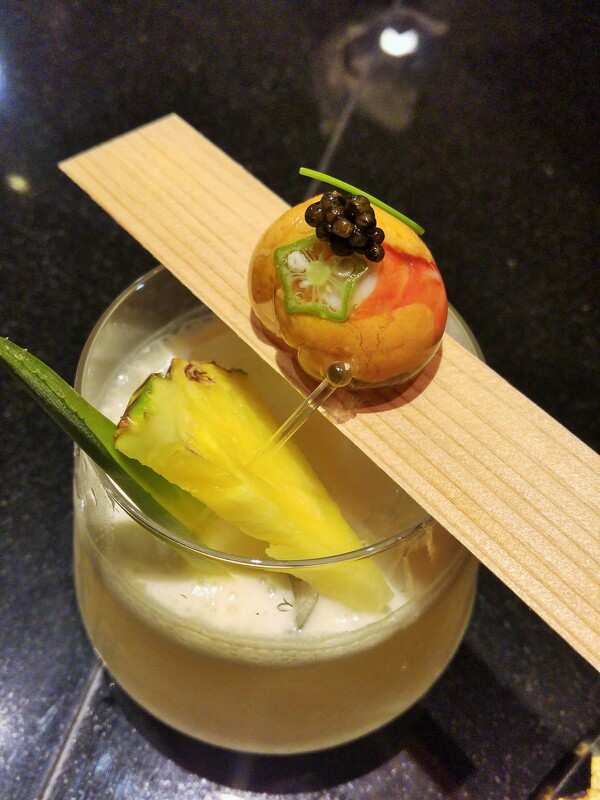 Followed by a sip of the refreshing cocktail concocted with sake and pineapple, this prepped my palate for what was to come - Foie Gras. 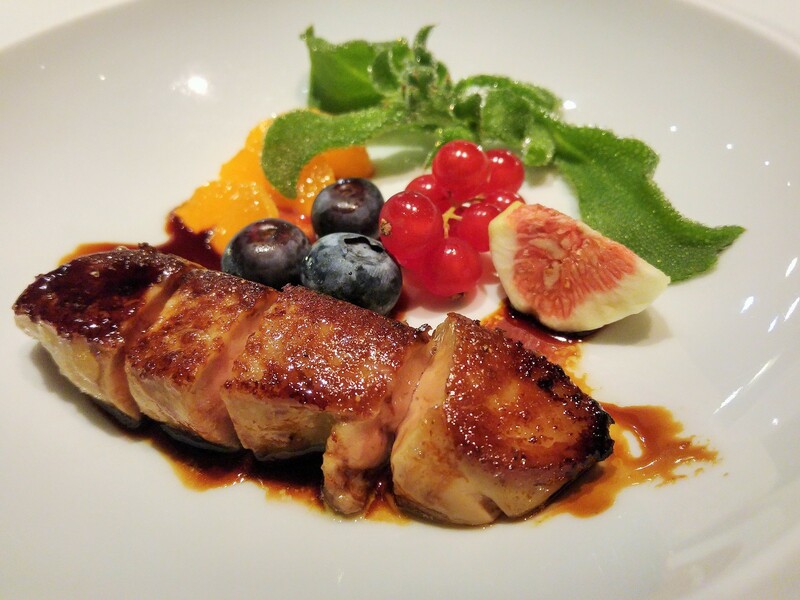 Foie Gras, seared with crisp sides, was almost like a melted aged cheese to me. Intensified by the accompanying sweet, savoury Teriyaki sauce, I could appreciate its flavour even more so. The seasonal fruits helped to cut back its richness. 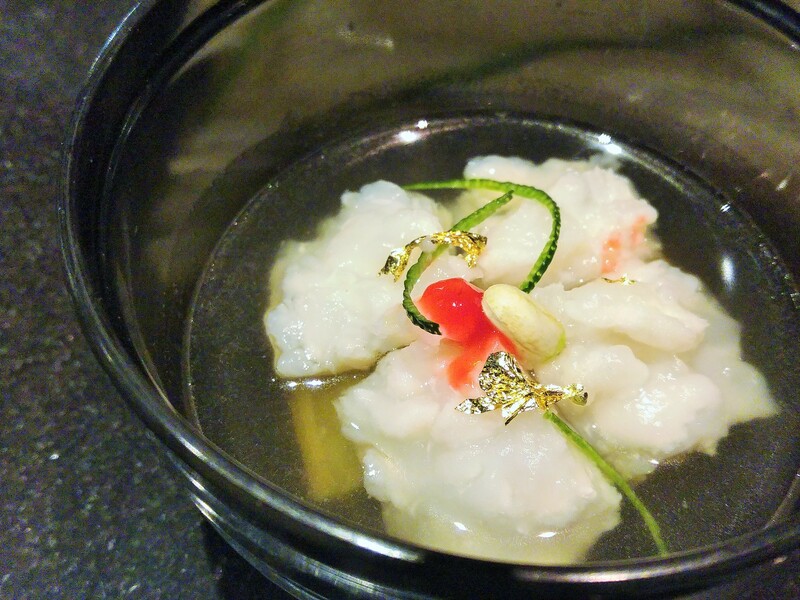 To cleanse our palate, Chef Moon presented a soup item - Seasonal "Hamo" Fish Clear Soup. 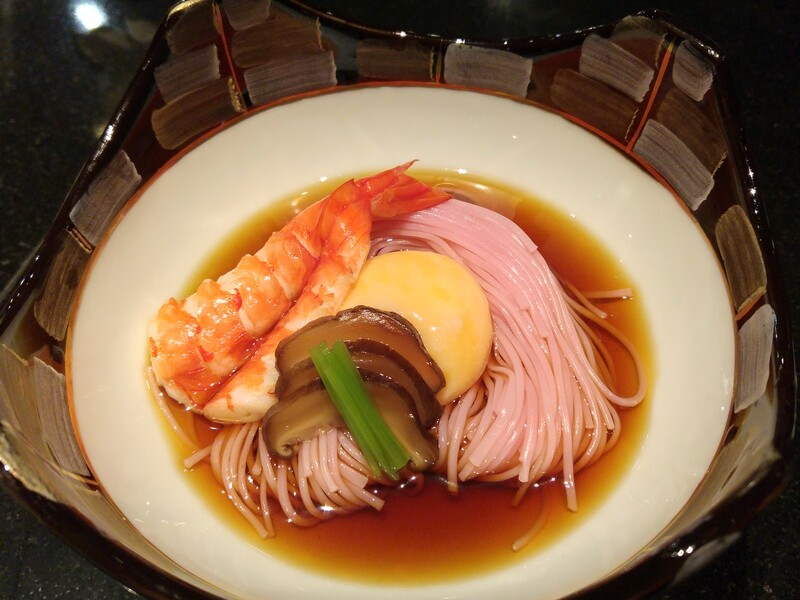 The warmth of the soup releases the fragrance of the plum and the yuzu flower. As I cupped the bowl with my hands and brought it closer for a sip, I was surprised by the hint of plum's fragrance. It was so comforting to feel the warmth in my hands and smell the sweet smelling plum upon drinking. Next we had Kyushu Abalone. 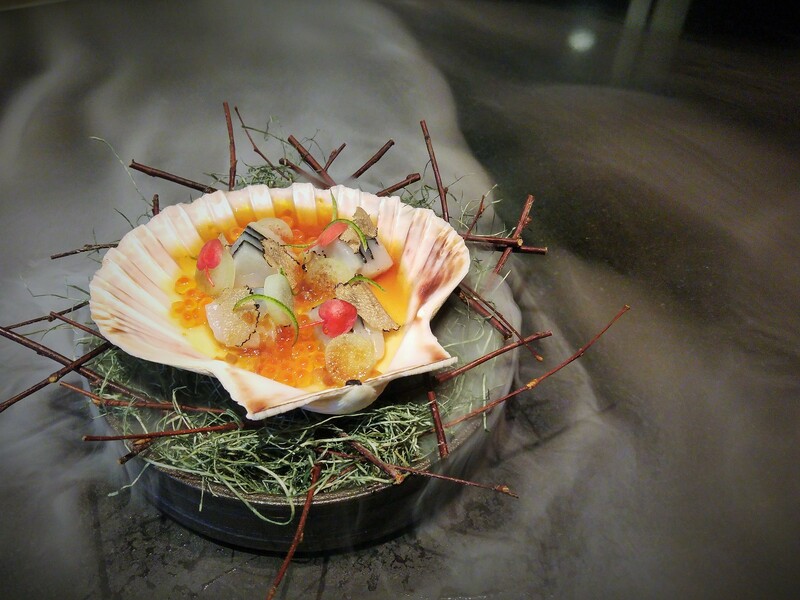 When a usual abalone dish is hardly original, this however, intrigued my appetite. 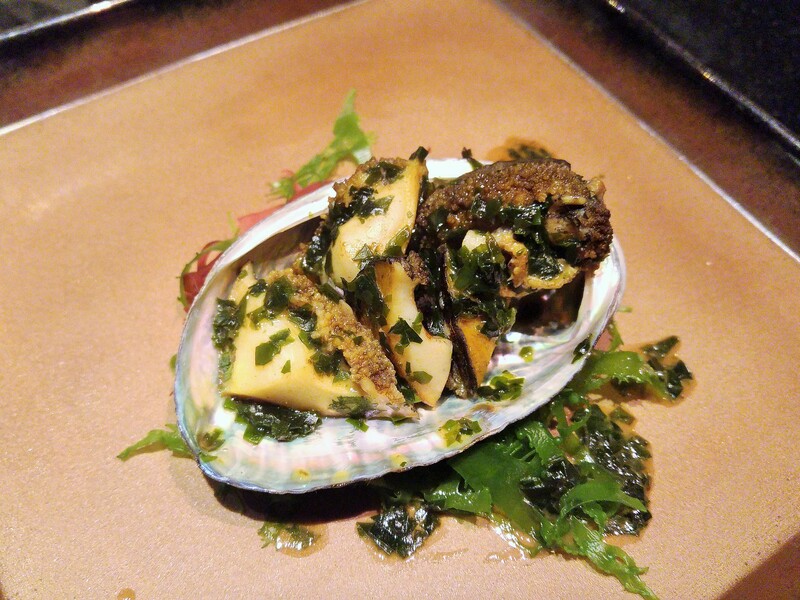 Greased with buttered Seaweed Sauce, That really makes this abalone dish exciting for me. 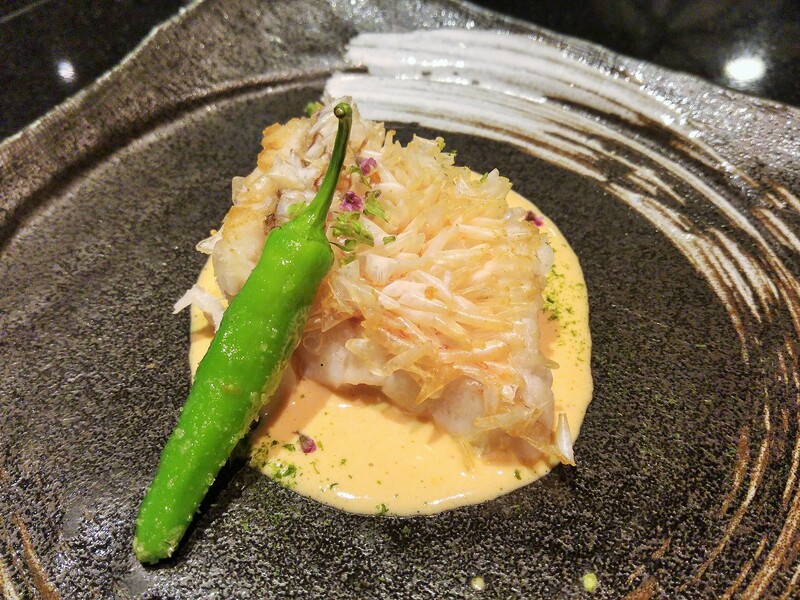 To refresh our senses again in preparation for the next Chef Mok's creation, we had Hokkaido Snow Crab. This is one of my favourites of the evening. 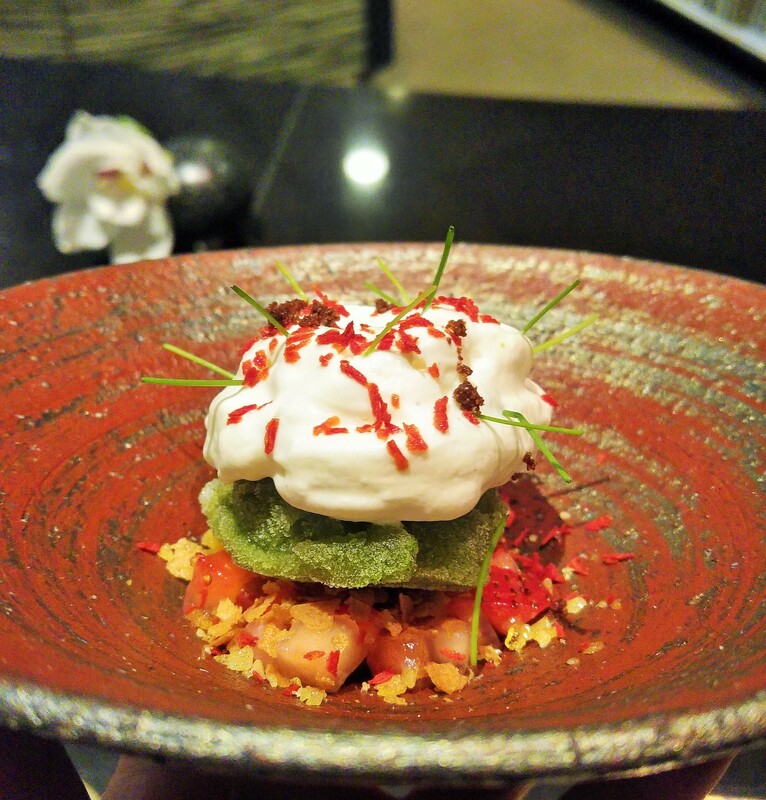 All the elements incorporated into making this dish set to rejuvenate our senses. 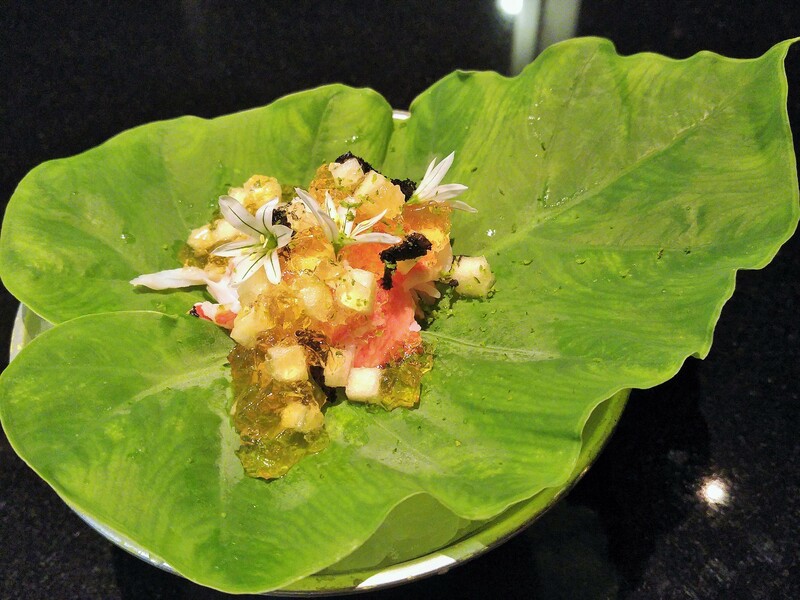 Apart from the organic green plate which awakened my eyes immediately, there was the tangy yuzu jelly and the refreshing crunchy diced amori apple. The star is of course the Hokkaido snow crab, that was pleasingly sweet and tender. One of the most luxury fish of Japan, Sweet Sea Bream, was up next. Once the oil has reached the right temperature, Chef Mok gently placed the Ama Tai into the wok. Crispy is an understatement, when each scale of the skin was crisped to spikes. In contrast, the fish underneath was moist, almost buttery like cod. The Sea Urchin Cream reminded me of a foie gras cream which I had recently tasted, but much mellower. All I wish was to have a spoon to scoop every single drop of it. I reckon it's not easy to put two strong ingredients together, but there's no tug of war happening here at all. Only with great understanding of both ingredients can such brilliant execution be achieved. After sinking our senses deep into the moist, rich and cream, Chef Moon's Hokkaido Scallop uplifted them with its crunch and zest. The effort that goes into creating and plating this dish is unbelievable. The dry ice sublimed with a release of lemongrass perfuming the surrounding. Sliced and layered with seaweed in between, the sweetness of the scallop was being elevated. Beautiful apple blossoms dotted the earthy tone, like fallen summer petals. Not simply decorative, each of these tiny buds actually releases a sweet and tart flavour, which jelled well with the fragrant lime zest and the crunchy pickled lotus yam. 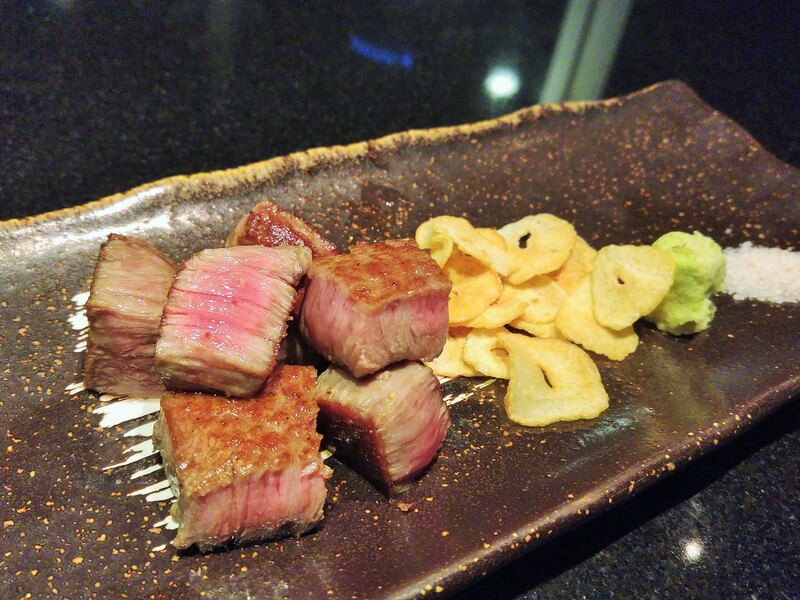 The evening reached its climax with Chef Mok's Miyazaki A5 Wagyu Tenderloin. I was really anticipating this dish. I only had it once before at Gyu and I didn't expect to be blessed with it again. Chef Mok has a way to eat it, and hence, please hold your chopsticks and watch his demonstration before you start. Medium rare, crispy garlic on top, and than a dot of Wasabi. Taste the original first, before dipping it into the salt, if it's really necessary. Exquisite piece of meat, it melted in my mouth like no other. With all the heat built up inside us, Chef moon cooled us down with his Hiyashi Plum Somen Noodles. The egg helps to bring all the ingredients together by coating the noodles and thickening the cold soup. I wish I could slurp it like Japanese do. Just when I thought my stomach was full, I finished it within minutes. I love vegetables, and tonight's dessert, Japanese Shiso Leaf Sorbet, just reaffirmed my affection for it. I like Shiso leaf, especially with sashimi. To eat it in dessert form is amazing. It was almost 10pm when I had it, and I think I wouldn't reject the second bowl if I'm afford another one. When I first arrived, Chef Moon introduced his menu in the sense that his dishes are more to support Chef Mok's , for palate cleansing in some ways. However, I feel that both work towards accentuating each other's strength, complimenting and balancing each other. It is the existence of the heavy and rich dishes that allows me to have a much fuller appreciation on the light and refreshing dishes, vice verse. Indeed, it is eye-opening to see Chef Mok and Chef Moon, both of no Japanese origin, to display such expertise in Japanese cuisine. From menu creation to execution, the food becomes a language for both accomplished chefs to communicate their respect and appreciation for each other's skills, knowledge and philosophy in their own respective ground. The 5-course lunch menu priced at $168++ per person and the 9-course dinner menu priced at $258++ per person. Premium sake pairings are also available during lunch and dinner. Written By Si An. A girl who is allured by travelling, loves the feel of freedom, smell of the rain and the aroma of fine coffee and food. All photos credit to Fairmont Singapore.